Servicing clients since 1999, ShadowTV is located in the historic Film Center Building in the heart of New York City. ShadowTV is a thought – leader in developing innovative, cutting edge technologies and created the first real-time video streaming technology. We provide access to all the news coverage you need: TV, Internet, Print and Radio in the form of the fastest, easiest to use Media- Monitoring service. Who? Corporate communications Directors , Government Agencies, Publicists, Broadcast Executives, Film Producers, Print and Network News Writers and Researchers, Entertainment and Political Figures – all rely on ShadowTV’s reports and alerts. 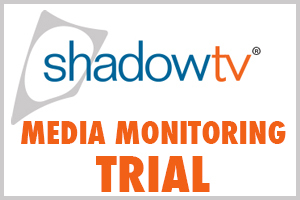 With ShadowTV®, the news comes to you. © 2019 - Shadow TV - All rights reserved.